Please join the Bicycle Advisory Council's Facilities Committee (BAC FAC) for a ride August 10, 2013 to check on signage and trail connectivity between the District and the trails of Prince Georges County. The ride will began at approximately 10:00am at the NOMA Gallaudet Metrorail station. Please arrive at the starting point a few minutes beforehand. The ride should last no more than three hours. Specifically, the ride will begin at the NOMA Gallaudet Metrorail station (near the N Street NE entrance) and will travel north on the Metropolitan Branch Trail. The route will pass the new trail extension, which runs besides the nearly completed Monroe Street Market. 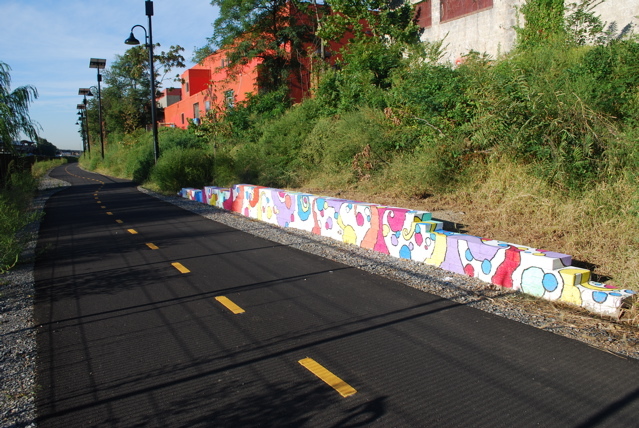 The ride will then turn east near Fort Totten and use the streets and trails that connect the District to the Northwest Branch of the Anacostia Tributary trail system in Maryland. We will return using a similar route. This connection differs from the Anacostia Riverwalk Trail route, which runs parallel to the Anacostia River. While the the Riverwalk trail is more scenic, this route could potentially provide access to the District for hundreds of daily commuters and recreational travelers. BAC will examine some of the barriers to the trail's completion and provide suggestions the District Department of Transportation. Thanks and we look forward to seeing you and hope you can contribute to making the District better for bicycling.